Korean rock band CNBLUE member Kang Min-hyuk will be making his debut on the small screen through a role in an upcoming SBS drama. A press release from the show's promoter J Story announced that Kang Min-hyuk will play the role of Hwang Yeon-doo for the new Monday and Tuesday series, "It's Okay, Daddy's Girl". "It's Okay, Daddy's Girl" is about Eun Chae-ryong (played by Moon Chae-won) who makes sacrifices to help her family after her father's accident. 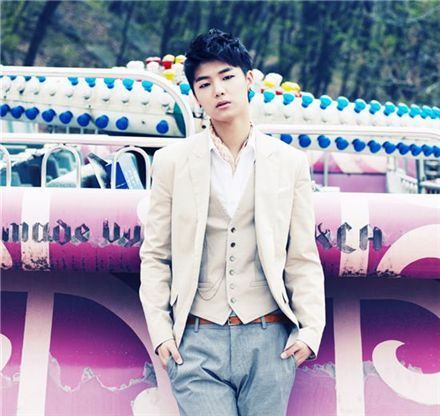 Kang Min-hyuk's character is a drummer of an unknown band feeling one-sided love for Chae-ryong. "I am excited to be making my small screen debut. I will try to do my best in putting on good acting skills and even though I may lack in some areas, I hope the audience will watch my acting with an open mind", Kang Min-hyuk was quoted saying. "It's Okay, Daddy's Girl" will premiere on November 22 after current series "Doctor Champ" ends its run. Kang Min-hyuk made his debut as the drummer of the four-member rock band CNBLUE, releasing two singles in Japan before their debut in Korea early this year. He recently attended the Pusan International Film Festival with bandmate Lee Jong-hyun to promote their film "Acoustic". Girls' Generation to release new mini-album "Hoot"